Gophers create extensive underground burrows that create unsightly mounds of dirt and damage plants in yards. 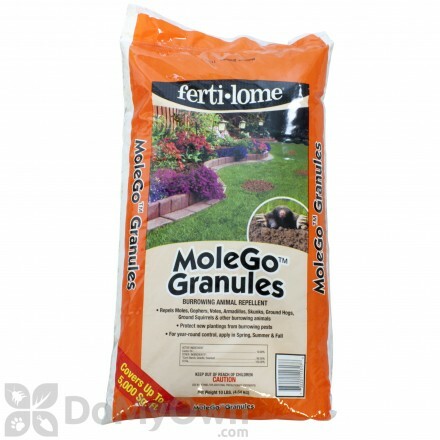 Removing gophers can be tricky, but it is possible thanks to our selection of professional grade gopher control products. Gopher traps, bait, and other control methods will help you remove gophers, the first step in repairing your yard. 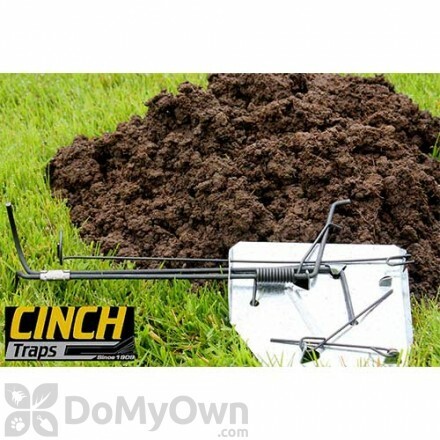 Professional heavy-duty gopher trap designed to remove the rodent fast and humanely. Easy to use. Can be used multiple times. A single-feed bait for pocket gophers. Cost effective red grain with Diphacinone for gopher control. Easy to apply in lawns, golf courses, rangeland and non-crop areas. 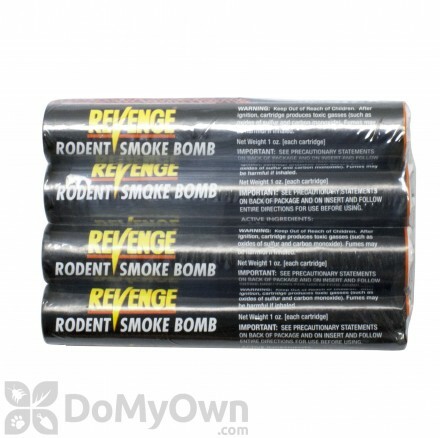 An effective pocket gopher bait that is mainly for household use. 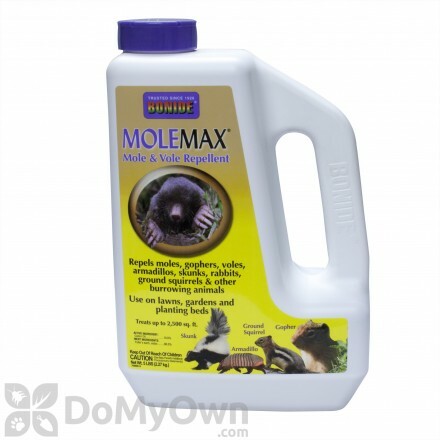 A non-toxic, easy to use repellent that deters rats, mice, rodents, gophers and other small mammals. An 18-inch probe with handle grips, funnel, and scoop. A great tool for applying bait for gophers. Comes with Gopher Getter Type 2 Bait. Live trap for catching chipmunks, gophers, rats and similar sized animals. The Professional Series Rigid Live Trap with One Trap Door for chipmunk, gopher, rat, muskrat & similar sized animals. 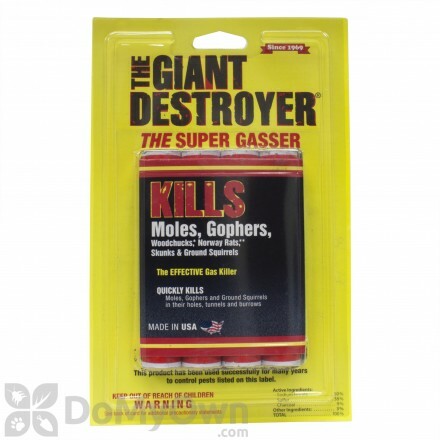 Professional heavy-duty gopher trap designed to remove the rodent fast and humanely. Each Gopher Trap Kit contains 3 traps, 3 flags, and an instructional brochure. Easy to use. Can be used multiple times. 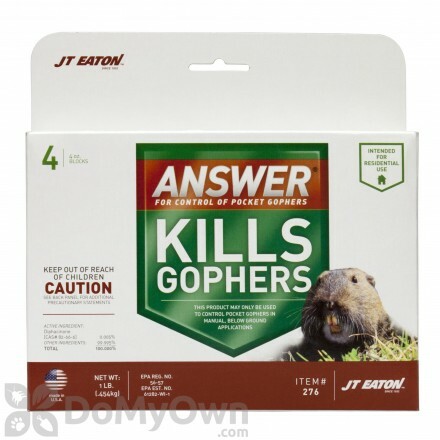 A simple tool that allows you to easily apply gopher bait and includes Type 2 Bait. A great tool for applying bait for gophers. Comes with Zinc Homeowner Bait. Professional heavy-duty gopher trap designed to remove the rodent fast and humanely. Each Deluxe Gopher Trap Kit contains 3 traps, 3 flags, a tunneling tool, gloves, maintenance spray and an instructional DVD. Easy to use. Can be used multiple times. Commonly called pocket gophers for the external cheek pouches they carry food with, there are many different species of gophers varying from state to state. However, in general these animals are roughly six to ten inches long. They weigh about one pound and have very strong forelimbs with long claws made for digging. They have small, flat heads and their ears and eyes are adapted for dirt protection, with four long, continuously growing teeth that are exposed even when their mouths are closed. They only live about three years and can have one to three litters a year. Groundhogs, ground squirrels, chipmunks, voles, and moles are often misidentified for gophers. Gophers spend most of their time underground, and have a variety of habitats varying from species to species. For example, prairie pocket gophers tend to prefer open fields or meadows to build their burrows. Gophers are also particular about what soil they prefer to build in. They tend to go for porous, light, well irrigated and easy to move soil rather than clay rich and damp or sandy and rocky soil. Gopher burrow systems can cover anywhere from 200 to 2,000 square feet. Tunnels are roughly a foot below ground, but some chambers can be several feet under ground. Gophers are solitary and generally there is one gopher per system unless mating or raising young, although their can be many systems in one area. Gophers eat plants, shrubs, and trees, eating the roots and succulent parts of plants underground, but also feed above ground very close to their burrow openings, and can sometimes pull up plants and pull them into their burrows. *Read our complete gopher damage inspection article for more information. Gophers are not all bad; their digging can help to aerate and fertilize the soil. However, often they cause more damage than good in a home yard or garden. They can damage water lines, sprinkler systems, soil erosion, unsightly mounds, and can damage plants above and below grounds. Gopher holes usually plugged, and gopher mounds are usually crescent or horseshoe shaped. *Read our complete gopher treatment & control article for more information about getting rid of gophers. It is best to control gophers when they are near the surface of the soil, generally in the spring or fall. Otherwise, you will have difficulty reaching them and your time and money will be wasted. 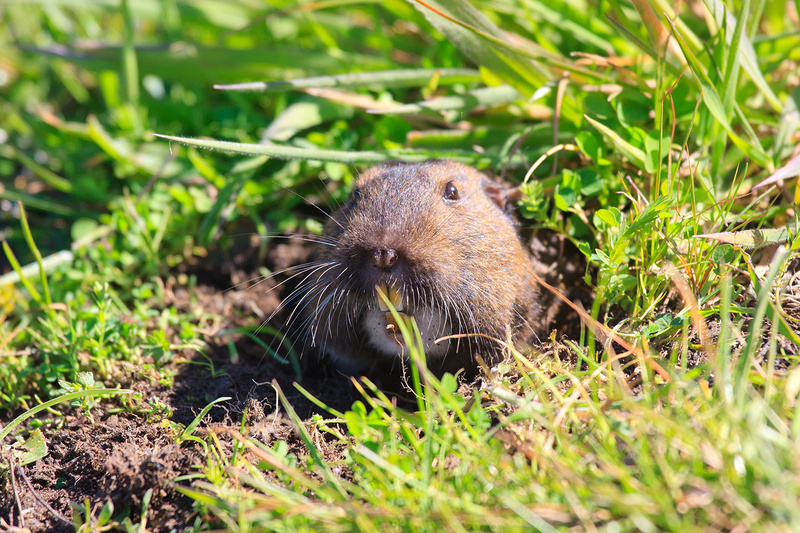 Before starting your gopher removal, call your local extension office to see if gophers are protected animals, or if you need any permits or licenses to rid your property of nuisance wildlife. Essentially you can choose to use traps (killing traps) or toxic baits, as they are the most effective means of gopher extermination. Other options include exclusion and the more extreme flooding and explosives. Here are some basics on these methods. Gopher traps are especially effective in smaller areas but may not be a good choice for large fields or even large lawns. Proper placement of traps is key for this method. You need to find the main burrow of the gopher using a probe, either homemade or commercially bought, and locate the fresh dirt. Probe away from the plugged side of the mound about a foot away and a half-foot or foot deep. You will encounter a change of resistance, which indicates the burrow. You may have to try several times to find the burrow. Once located, you will have to dig with a trowel and set your traps. There are several pocket gopher traps available on the market. Some are easier to use than others, so choose appropriately. These are not live traps. You should place two traps back to back facing opposite ways in order to intercept the gophers. You don’t have to bait your traps, but you can if you want to try to increase your chances. You can use alfalfa, apples, and other succulent type fruit or vegetable. Attaching your traps to stakes can help you locate and monitor your traps. Check traps often. If you have not caught something in a few days, consider moving your traps to a new location. After checking whether this type of control measure is allowed in your area, you can begin to choose the type of gopher bait. Similarly to traps, you will have to locate the main burrow following the steps indicated in the traps section. There are different types of baits, like strychnine and anticoagulants, so you must choose which bait to use. Strychnine based baits work more quickly and with less bait, while anticoagulants work oppositely. Just like trapping, you will have to dig down to place your baits in the main burrow. If using bait in a very large area, you can use a probe that has a bait reservoir, allowing you to locate and deposit baits without digging. If plant damage is your main concern, you can try exclusion. You will have to dig about two feet down and place hardware cloth or wire mesh, flaring the ends out at a 90-degree angle that extends about six inches. Extend the mesh or cloth a foot above ground as well. Some people choose to use explosives or to flood the gophers out, but these methods are a bit more extreme, although they can be effective. Natural predators, including owls, snakes, cats, dogs, and coyotes, can be encouraged, but since gophers spend most of their time underground, this can be difficult. There is no gopher repellent or frightening device proven to be effective against gophers. See all of our animal control products for solutions to other animal pest problems.